Today is Mother’s Day, which is a special day for anyone who is a mother, or has ever had a mother or mother figure to care for them – hopefully that’s all of us. Celebrations of motherhood are not a new idea; the ancient Greeks and Romans had festivals in honour of the mother goddess Cybele, and the Christian Church commemorates Mothering Sunday on the fourth Sunday in Lent. Although the mother being honoured on this day is the Virgin Mary, traditionally it was a day for people to spend with their own mum, and bring her flowers and cake. The Mother’s Day we celebrate in May was started in the United States, and came out of the women’s peace movement. In 1868, Ann Jarvis tried to promote a pacifist Mother’s Day, and when she died in 1904, her vision was still just a dream. Ann’s daughter Anna Jarvis was determined to continue her mother’s campaign, and by 1914, US Congress had passed a law proclaiming the second Sunday in May would be called Mother’s Day. Unfortunately for Anna and all her hard work, she soon became horrified by the commercialisation of Mother’s Day; greeting cards and boxes of chocolates were not at all what she had had in mind. For the rest of her life, she protested against it, and in the process was arrested for disturbing the peace. Anna spent all her savings trying to stop what she had accomplished, and died in poverty in 1948. The tradition of giving gifts on Mother’s Day was begun in Australia by a Sydney woman named Janet Heyden. In 1924, Mrs Heyden made a visit to someone in a state women’s home, and was saddened to find so many neglected mothers. To cheer them up, she organised schoolchildren to help bring them gifts donated by local businesses. Janet was also disappointed by the commercialism of her idea, but sensible enough to realise that more good than harm would come of it. She continued visiting lonely mothers and cheering their days until she died in 1960. The traditional flower to give your mum for Mother’s Day in Australia is the chrysanthemum, because it is an autumn flower, suitable for the season, and ends in mum. The flowers originate in China, where they symbolise cleansing and health, and when they were introduced to Europe, they were named chrysanthemums, meaning “golden flower” in Greek. The Ancient Greeks also had this flower name, but they used it to refer to the daisy-like weed we call the corn marigold, which has been brought to Australia and grows wild here too. 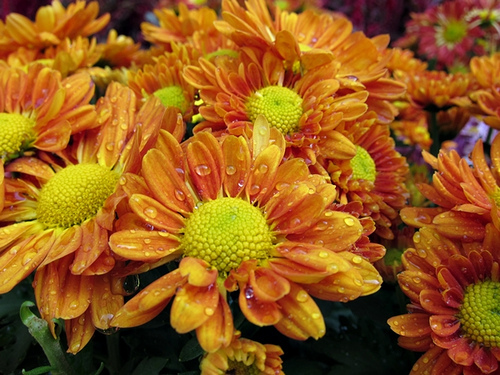 Chrysanthos or Chrysanthus is an Ancient Greek name meaning “golden flower”. Saint Chrysanthus was an early Christian martyr, the husband of the supposed Vestal Virgin named Daria who converted to Christianity. That part of the legend can’t be true, but nonetheless Chrysanthus and Daria were very popular saints, and the name was well known. There was a Roman governor in Britain in the 4th century named Chrysanthus, and Chrysanthos has been used in modern Greece. Chrysanthe is the feminine form of Chrysanthus, and can also be spelled Chrysanthi (the more obviously Greek spelling). The name is pronounced kri-ZAN-thee. Chrysanthe is also the French form of Chrysanthus, so has been used as a male name in French-speaking countries, including French Canada. Chrysanthe is a rare name, and has mostly been used in Greece, and by those of Greek heritage. It doesn’t show up in the data in either the US or the UK. However I have seen it used in Australia, and not only on people from a Greek background. A famous contemporary namesake is American/Australian composer and violinist Chrysanthe Tan, who is of Greek heritage, and may be giving the name some publicity. There’s something a little extravagant about Chrysanthe – it’s gilded, artistic and showy. Yet it doesn’t sound much different to the more familiar Christina, Anthea, and Xanthe. It is tied by sound and meaning to the chrysanthemum flower, which makes it an ideal name for a daughter born on, or near, Mother’s Day.The traditional nickname is Chryssa, but you could also use Chrys, Chryssie, Thea, or Zan. Chrysanthe received an approval rating of 65%. Opinions on the name were fairly evenly divided – 25% of people thought it was an okay name, while 18% of people hated it.